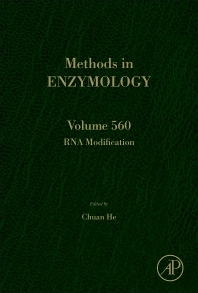 RNA Modification provides a useful examination of the science and its role in biological regulation, the current frontier of life science research, and includes various RNA modications and their role in gene expression. It represents the most up-to-date knowledge and protocols available today. Scientists interested in RNA modifications, post-transcriptional gene expression regulation and regulatory RNA. Chuan He, Ph.D., is the John T. Wilson Distinguished Service Professor in the Department of Chemistry and Director of the Institute for Biophysical Dynamics at the University of Chicago. He is also a joint Professor in the Department of Chemical Biology and Director of the Synthetic and Functional Biomolecules Center at Peking University. He was born in P. R. China in 1972 and received his B.S. (1994) from the University of Science and Technology of China. He received his Ph. D. degree from Massachusetts Institute of Technology in chemistry in 2000. After being trained as a Damon-Runyon postdoctoral fellow at Harvard University from 2000-2002, he joined the University of Chicago as an Assistant Professor, and was promoted to Associate Professor in 2008, Professor in 2010 and John T. Wilson Distinguished Service Professor in 2014. He is also a member of the Cancer Research Center at the University of Chicago. His research spans a broad range of chemical biology, epigenetics, cell biology, molecular biology, biochemistry, structural biology, and genomics. His recent research concerns reversible RNA and DNA methylation in biological regulation. His research group discovered the first RNA demethylase and showed that reversible RNA methylation significantly affects post-transcriptional gene expression regulation. He was selected as an Investigator of the Howard Hughes Medical Institute in 2013.